Michael McIntyre's Big Show returns to BBC One for the biggest series to date. Filmed in front of a live audience at the Theatre Royal, Drury Lane, the show is packed with celebrity guests, musical performances, stand-up comedy and surprises. 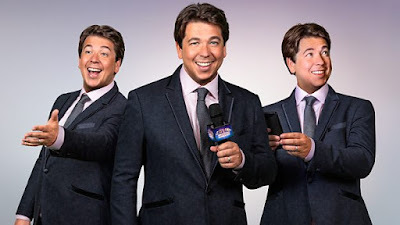 What can you tell us about the new series of Michael McIntyre's Big Show? Everything about the new series is bigger and better than the last. Send to All is back where I send some very silly texts to all the contacts in celebrities' phones and we see what hilarious replies they get. Unexpected Star returns! So many people have nominated people for us to surprise that we have been able to pick some wonderful people. There's a married couple, a pilot, the oldest Unexpected Star at 92 years old and the youngest at 11 years old. And the hilarious Midnight Gameshow is back where I creep in to people's bedroom's in the middle of the night and wake them up with a gameshow, if they snooze they lose! What stunts can we expect for the Unexpected Star this series? We are doing more and more elaborate things and its crazy the way we're surprising people in the theatre. Last year we turned the theatre into a hotel and the attention to detail was incredible. This series we have an actual aeroplane fuselage on stage and the Unexpected Star, who is a pilot, sits in a seat and the front of the plane falls down for him to find himself in the middle of the stage. We've turned the theatre into a haunted house complete with a ghost train ride that travels through a set of doors straight on to the stage. We also turned the theatre in to a cinema and built an actual auditorium on the stage. The Unexpected Star sat in her seat with her popcorn and the screen fell down to reveal the packed Theatre Royal on their feet applauding her. All the Unexpected Stars have been incredibly shocked but have bought the house down with their amazing performances at the end of each show. I can't wait for people to see them! Has the surprise for the Unexpected Star ever gone wrong? We've had things nearly go wrong, we surprised a group of nurses the Christmas before last, they thought they were getting into a lift, the doors would open on the other side and they would find themselves on the stage. Only the lift doors wouldn't open the whole way so I had to climb in and get them all out. It almost went wrong this series with our oldest star to date, David (92) who thought he was going to buy a new walking frame and Lionel Blair, who was part of the prank, called him by his name. David kept saying, "How does he know my name?" But we got away with it! Have you ever felt emotional watching the Unexpected Star perform? So many times people say things like it's a dream come true to perform for so many people and on TV. But when the Unexpected Star is in their 90's like David is it felt that much more real and poignant because he really had waited a lifetime for this moment and he was determined to make the most of it and he really loved it. I was watching the monitor at the side of the stage and thought this is amazing, this is everything the unexpected star can be, it just encapsulated it perfectly and I did well up. Who have you got playing Send to All this series? Send to All has been hilarious this series. We've got Holly Willoughby, Eamonn Holmes and Ruth Langsford, Josh Groban - who's our first American, Anton du Beke and Bradley Walsh and we're recording Cheryl playing it next week. The texts have been really fun and the replies brilliant. Who's been your most memorable Send to All so far across the four series? There's been so many that have been brilliant across the four series it's hard to pick just one. I really liked Jamie Oliver as I felt it was a really clever text. Ed Balls had some of the funniest replies but people's favourite tends to be Danny Dyer's, everyone loves Danny Dyer, it was so much fun to watch. There's been so many that have been brilliant; Ronan Keating, Carol Vorderman's, Geri Horner, all of them really. It's just so fun to nose around people's phones who never know where the comedy is going to come from. Alan Shearer has alarms set every few minutes on his phone; on this series Bradley Walsh has weather from about 15 different places on his phone. The Midnight Gameshow was a huge hit last year, can you tell us about some of the surprises in store this year? We've been doing a new thing called who's singing in your shower? We've been getting people out of bed and taking them to their bathroom where there's been a popstar singing in their shower and they have to identify who it is. We've had some great special guests for The Midnight Gameshow like Mr Motivator who made people exercise in their bed, Timmy Mallett playing Mallets Mallet, SpongeBob SquarePants, Joey Essex, Wayne Sleep, Derek Acorah to name just a few. We were playing the Midnight Gameshow with a woman from Merseyside and Mr Tickle came into the bedroom and I asked her which of the Mr Men he was. She didn't know, so to give her a clue he tried to tickle her husband but couldn't move his arms so instead of tickling he just kept bouncing into him which gave me the giggles. She named every Mr Man apart from Mr Tickle whilst Mr Tickle was trying to tickle her husband without the use of his arms. It was hilarious. We've also filmed a special celebrity Midnight Gameshow for this series with Gino D'Campo which is as funny as you would imagine and are filming another one, but obviously can't say as it will be a big surprise for them but it's a great one! Do you have a most memorable contestant from The Midnight Gameshow? We did four last year that went really well, it's about how people react, there's so many layers of excitement to a midnight gameshow. The lady in Merseyside could not stop laughing and that's just wonderful, that's what you want really, she might be my favourite. We had a guy in Wales who never really woke up, he didn't have a clue what was going on the whole time which made it very funny. There was a girl in Essex, she was incredible as well, complaining about her eyelashes not being on the whole time, hitting her husband with a pillow because she couldn't believe she was going to be on TV without her eyelashes in. Which music guests have you got on this series? We've got amazing music performances this year from Nile Rodgers, Rita Ora, Kylie, George Ezra, Paloma Faith, Little Mix, Cheryl, Michael Bublé. I had a great moment with Michael Bublé where I asked him if he could teach me to sing like him and he said why we don't sing together, so we did! It was great because my wife and children came to watch his performance. I did every dance move I could think of in-between, I even greatly embarrassed my children by doing that floss dance very badly. It certainly felt very showbizzy, what a charming, lovely man he was, very generous and game for a laugh. When you first started the show, did you imagine you would be going for this long - four series? We had a lot of new ideas and didn't know if they would work but as soon as they did on the first recording it was very exciting. We've just tried to make every show and series better than the last as we get more experience and confident. I initially made the show because I was watching TV with my kids on a Saturday night and I liked the dynamic of the whole family watching TV together and found trying to create a show that everyone can enjoy really appealing.